Lawrenceville is a wonderful area of Pittsburgh. While many places close on Mondays, Tamari is able to prosper. We went last night with a friend to exchange gifts and share a meal. When walking in at 6pm we were told the first available table would be 9:00pm or 9:30pm, but we were welcome to sit at the bar. Typically that line wouldn’t have worked with us, but our friend chose the location and it happened to be happy hour with a mere 3-4 people at the 10 bar seats. For happy hour, all drafts, cocktails and tapas are half off so we stood to be able to sample a lot with out paying a lot. And that’s what we did. After a half-price classic Mojito, I ordered the Grilled Romaine from the cold tapas menu and the Lobster Macaroni and Cheese entree. The tapas was delivered quite quickly and tasted well. There was a watery dressing on it that I couldn’t decipher but complimented the dish. It was served with pickled onions on the side. As for what was topped on the romaine, no one flavor stood out, so it was a balanced dish – a true (possibly healthful?) steal at half-price! 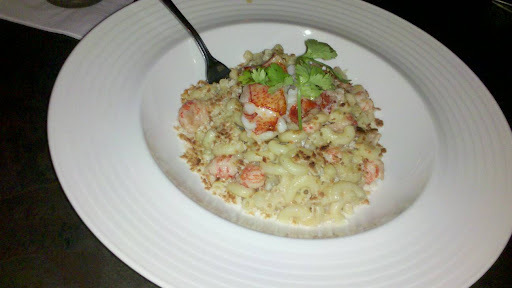 The lobster mac n cheese delivered piping hot and before I was done with the romaine. Once it cooled a minute, my first bite yielded a creamy smooth cheese and maybe two lobster pieces. The shear amount of lobster in this dish left me in awe that they price this at only $20. 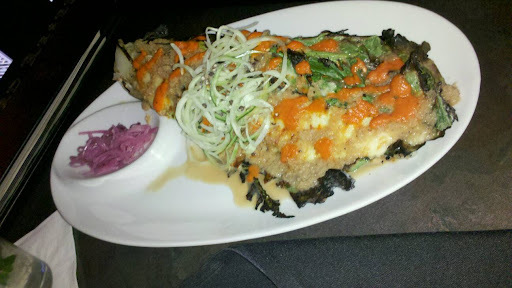 Aside from pieces mixed throughout the dish, two larger pieces garnished the dish on top. Tamari as a whole was a good experience. I would definately go back, perhaps during the happy hour to sample more of the tapas, like the duck quesadillas or braised pork belly each under $5 during happy hour. Despite not planning this trip with a reservation it turned out well and we had the opportunity to exchange Christmas gifts with a dear friend. Interested in what I got as a gift? You may note that I often host friends to watch the Steelers games at my house. For the east coast 1pm games, there are days when not everyone has had their coffee yet. Since the person I was exchanging gifts with is a regular and a hefty coffee drinker, he bought me a 12-cup Mr. Coffee coffee maker, which is an upgrade from my 5-cup which had gotten me through so many mornings. It was a total surprise and I’m sure it will get well utilized.